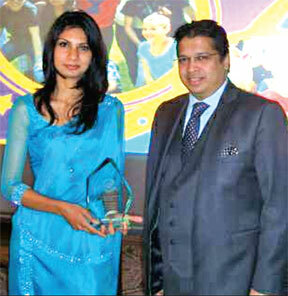 Sri Lankan Anoka Primrose Abeyrathne, 23, won the 'Commonwealth Youth Award for Excellence in Development Work 2012' for the Asian region at the Commonwealth Youth Awards Ceremony held on March 12 at the Marlborough House in London. She was the youngest and only female among the four award recipients. The other three award recipients were from Australia, Barbados and Kenya representing the Pacific region, the Caribbean region and African and European regions. The award ceremony was organised by the Commonwealth Secretariat and Commonwealth Youth Programme. Abeyrathne was nominated from Sri Lanka through the British Council. The awards celebrate young people (age 15-29) in the Commonwealth who are making a positive difference to the lives of others through development initiatives ranging from poverty alleviation to education and protection of the environment. With a track of record of excellence, she was the 2010 SAARC Youth Award recipient for outstanding environmental protection and climate change mitigation, and was featured third rank on the 25 World's Most Influential and Powerful Young People list of the Youth Services of America in 2012. She started volunteering and activism for social development and environmental protection at 14, while actively working to create sustainable development in underprivileged communities in Sri Lanka. Her work revolves on poverty alleviation through economic incentives, providing skills training for better employability such as IT training and basic resume making, eco-tourism guide training, handicrafts making and organic produce making to make communities a better place through youth employment, capacity building and changing perceptions regarding the environment through interactive workshops and dialogues. Her project is being replicated in Bangladesh and India.